Most PortaFab booths are shipped fully assembled and ready for immediate occupancy. (Exceptions include the largest models and those with Knock-Down Roofs). One can typically be using his/her new building within minutes of delivery. Just set it in place, connect any necessary power, and you're in business. All booths come with support boards that are attached to the booth for delivery (as shown below). These support boards allow cranes to move the booths from the truck onto their permanent platform. 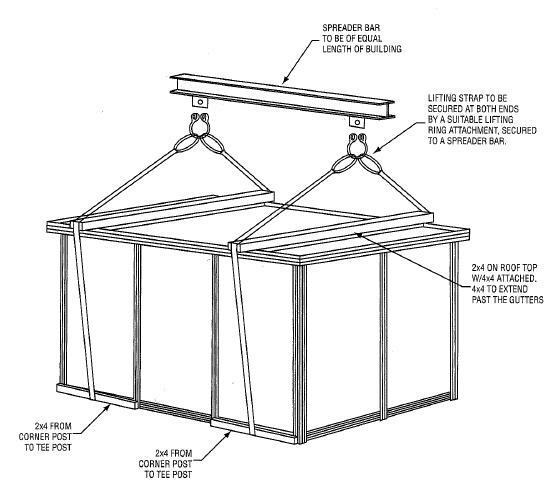 Many booths are outfitted with forklift pockets or lifting rings to provide more permanent portability to those who will be moving their building on a regular basis. Read more about Portability Options.